Who should take a MOOC? I was subject to significant ribbing regarding how easily the role of banjo playing, bible thumping, traveller preacher man came to me. In a session with more and weirder accents than a Bulgarian PC keyboard, what I said in a vignette of the old west was fairly close to the kind of thing I say anyway – as I think, in a way, it was for all of us. 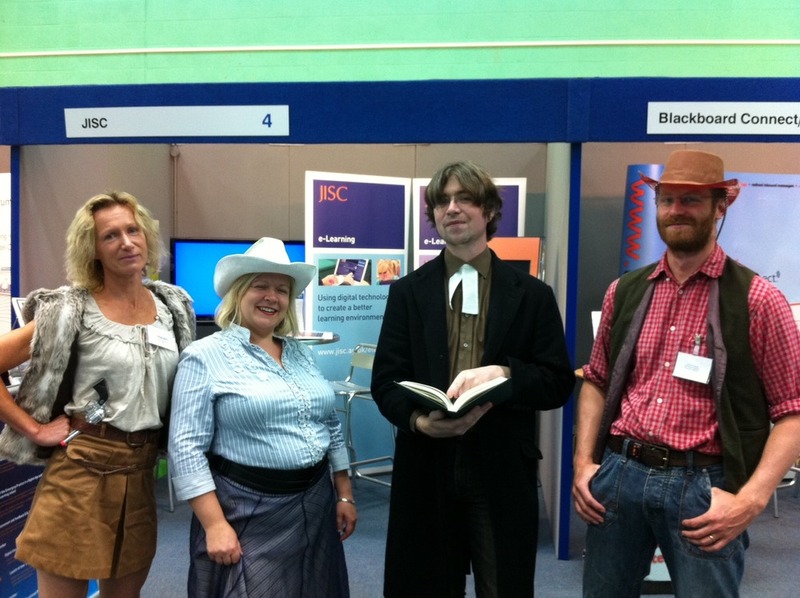 We chose our roles freely – Amber the sheriff, Helen the gadabout, Dave the settler and me. And at many points during the panel session it was difficult to tell whether we were in character or not. Talking about William Tyndale to Diana Laurillard whilst dressed as an C19th preacher was, probably, the oddest thing I’ve done at a conference since – er – talking to Diana Laurillard about guitar tab and OLGA at #OER11 (note to self: maybe do some “proper” conference presentations one day?). To me, questions around the lasting place of OER as a concept were most interesting. There seemed to be general agreement that the gains in knowledge, experience and understanding we had made via the OER experience were permanent, and were a lasting part of the landscape we are cultivating beyond the frontiers of academic publishing. Whether we would continue to be using it as a term in future seemed more open to question… @ajcann and others argue (and argue convincingly) that OER is not, and should not be, a demand side term. They are right. But on the supply side it is a useful bundle of concepts, and provides a focal encapsulation of a number of issues that academia (and I would argue, wider society) is struggling with. My contention was that OER was a symptom of a wider systemic issue, which takes in publishing, the idea of the public intellectual, online life, online practice and information as a right. As long as the machinations of legislators and company lobbyists keep propping up the bodies of the dead business models, we will need something like OER as an alternative. If we’re getting Hegelian about it, what is likely to emerge is a series of compromises that will require us “open evangelists” to sup with the devil and the (printer’s?) devils themselves to put down the pitchforks and open the gates a little. As long as the aggravating conditions are still there, the symptom will be there in some form. Maybe we’ll be hurting our hosts in other places in the future, expanding fair use, improving citation… but there is no cure for us. And if left unchecked, we will do the system some real damage. It took nearly 400 years between Roman persecution of Christians, and the Romanisation of Christianity with the conversion of Constantine and the Edict of Thessalonica. We’ll be faster, though no-one will know the day or the hour when the publishers and the authors they exploit finally convert to openness. Multimedia-wise there’s a full (if rough) audio recording of the session (which covers an amazing amount of serious ground alongside the cowboyLOLs), courtesy of @easegill and wonderful #ds106radio, on soundcloud. And @jamesclay offered a startling ALT Live Beta video interview with the four of us in full western regalia, complete with banjo music. I suspect there is more video to come from the session too. And of course the trailer. All of it brought to you by CC-BY! This post represents my own views, not those of my employer. It is available under a CC-BY license. Whatever happened to the MOOC?